If you're serious about buying a Cessna 182 Trainer package, then look no further than this. The Brand new 2012 Cessna 182 electric flight trainer kit. It has everything you need to get flying, and is a stellar performer in the sky. Light weight design means that it will take off and land very easily from Grass surfaces, and less chance of damaging gear with heavy landings. Flight performance is excellent, everything you want from a trainer. The power system is capable of pulling the 182 vertical as seen in the video clip below. With the inclusion of the new 3-Blade Prop you can achieve outstanding flight speed, which gives the Cessna the capability of all manner of mild aerobatics, loops, rolls, stall turns and so on are all at your finger tips. 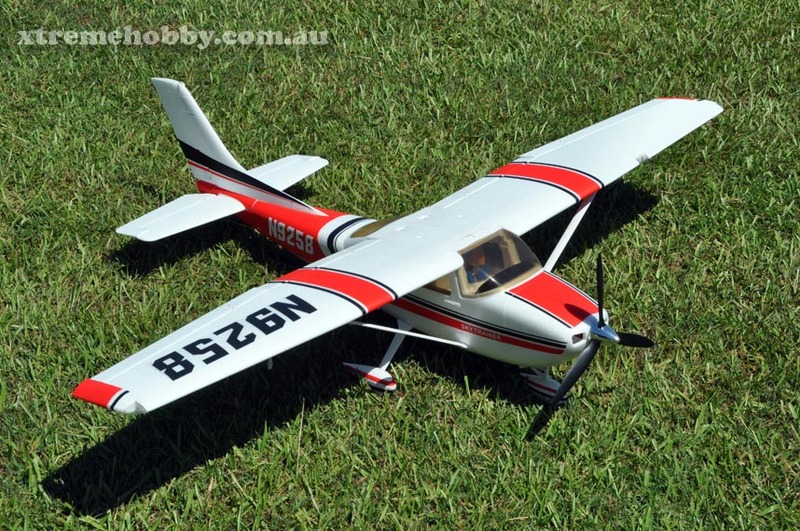 Add to that the almost silent joy of electric flight, and you can't go past this excellent Cessna 182 Skylane complete remote control 6 channel trainer from Xtreme Hobby. As an added bonus the new 2012 model now comes complete with an upgraded Brushless Motor, 3 Blade Prop, Metal Landing Gear system and Pre-Installed L.E.D Navigation Lightning system. Full rudder, elevator and aileron control, just like the real Cessna 182 with dual aileron servos for precise movement + the edition of Flaps. 90% assembled - all electronics (servos, ESC and motor) pre-installed at factory, just finish airframe assembly, connect up the servos, charge the battery and fly!